It all started when Brian Scott, from Earlsdon Methodist Church, visited the Recro80 Festival at Stoneleigh. It was at this festival that he first experienced a live Steel Band. It left a lasting impression, and started him wondering if he could create something similar himself. After making some enquiries he shared his ideas with some like-minded friends, who gave him as much time and advice as they could. Equipment for the band was begged, borrowed, made and - if all else failed - bought. So, on Easter Monday 1981, Brian gathered together a group of young people for a day of experimenting with their newly collected musical tools. 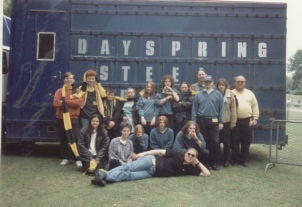 This was the beginning of Dayspring Steel Band. The band played its first concert at St. Augustine's School. Since then their journey has encompassed performances as grand as the Royal Albert Hall, Westminster Central Hall, Birmingham NIA, Birmingham Botanical Gardens, both old and new Coventry Cathedrals, and Brixton Academy ... as well as some less grand venues! They have performed at events as diverse as the Birmingham Super Prix, a Duck Race in Somerset, and the Earlsdon Festival, Church services, weddings and funerals. Stages have included tents, on the street, in fields, around the edge of a swimming pool, and on the backs of lorries! They have played in the rain (lots of times) and have even been snowed on. This was the day the whole country celebrated - it was the Queen's 80th birthday. However she had to share it with the Steel Band as it was their 25th Anniversary. To celebrate the occasion a special performance was given in the church, which was attended by many of the previous members who had participated over that time.